World Cup-bound Nigeria forward Alex Iwobi is set to bag a new contract at Premier League club Arsenal soon. He will get an improved deal in the summer, top sources said. “He will renew his contract in the summer,” one source disclosed. 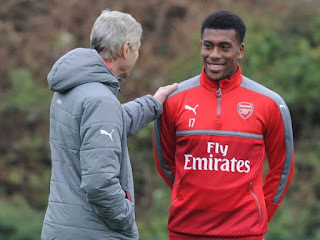 Interestingly, critics have questioned the Arsenal future of the nephew of Austin ‘Jay Jay’ Okocha following the departure of manager Arsene Wenger, who gave him his first big break at the club, at the end of this season. Now an established international, Iwobi’s last contract reportedly paid him 30,000 pounds a week, according to SCORENigeria report. He first signed a long-term contract with Arsenal in 2015 after he joined them as a six-year-old. He won an FA Cup winners medal with the London Gunners in the 2015/16 season. This season, he has scored two goals in 23 appearances in the Premier League.